Vegetarians and vegans have heard these statements over and over. Myths such as these simply will not go away without the solid facts to prove otherwise. We’ve attempted to reassure friends and family who shake their heads and click their tongues in utter amazement that we’ve survived many years on a vegan diet and still haven’t keeled over from lack of proper nutrition. Our only doctor visits consist of the annual check-up and accompanying lab tests that continue to affirm our excellent health. But simply telling people apparently isn’t enough. The hard fact that constantly comes to the foreground is that the focus on protein borders on obsession in countries of the Western Hemisphere. One glance at restaurant menus and the plates that come to the table is proof that the centerpiece of the meal is the large serving of meat, chicken or fish frequently smothered in creamy sauces or melted cheese. The portions served at one meal alone come close to fulfilling a day’s worth of protein needs. The meat and dairy industries spend billions of dollars to project their message right into your shopping cart through television commercials, magazine ads, and grocery store ads. These powerful industries even recognized it was important to teach young children “good nutrition” at a very early age. Since the end of World War II they spread their protein message to our nation’s youth by providing schools across the U.S. with colorful charts of the “important food groups” that emphasized meat, dairy products, and eggs. For the decades following World War II, one simply could not ignore the emphasis on protein. Could we fail to ignore the large billboards flaunting larger than life-size images of cheese, eggs, and milk? And who can forget the successful ad campaigns for “Where’s the beef?” and “Milk does a body good” ? The protein message comes at us from all directions, even on bus benches. Don’t misunderstand, we fully recognize that protein is a necessity to a healthy body, and that it is important to replenish our store of protein every day. Because the body doesn’t store protein as it does other nutrients, we’re aware it must be replaced each day as a source of nourishment for building and repairing new cells, hormones, antibodies, enzymes and muscle tissue. But, just how much protein do we really need? Recently, studies on nitrogen balance provided more accurate ways to measure the body’s protein requirements. Joel Fuhrman, M.D. in his book Eat to Livewrites that an easy way to calculate your own daily protein requirement according to the U.S. RDA is to multiply 0.36 (grams) by your body weight. That translates to about 44 grams for a 120-pound woman and 54 grams for a 150-pound male. In metric terminology the RDA is 0.8 grams per kilogram of body weight. Brenda Davis, R.D., and Vesanto Melina, M.S., R.D., in their book Becoming Vegan consider 0.9 grams per kilogram of body weight per day to be more ideal for vegans eating whole plant foods such as legumes, whole grains, and vegetables. Multiplying 0.45 grams by your body weight in pounds will give you the approximate protein need for your body. These figures are a little higher than actual RDA requirements but were considered necessary as a safety factor to account for reduced digestibility of whole plant foods versus more refined foods such as tofu, textured soy protein, and meat substitutes. With this slightly higher figure a 120-pound person would need 54 grams of protein daily and a 150-pound person needs 67.5 grams. Another way to calculate your RDA for protein is to take your weight in pounds and divide by 2.2 (pounds per kilogram) to determine your weight in kilograms. Then figure 1 gram of protein for every kilogram of body weight. Those who include tofu, textured soy protein, meat substitutes, and refined grains will find 0.8 grams per kilogram of protein daily quite adequate. Reed Mangels, PhD, R.D. says, “The newest RDA has looked at all the places where additional protein is needed in pregnancy (fetus, placenta, amniotic fluid, uterus, breasts, blood, etc.) and has recommended that protein intake in pregnancy should be 1.1 grams per kilogram per day or 25 grams more of protein than the RDA for non-pregnant women. During pregnancy and breastfeeding, protein needs can easily be met by adding a little extra of the foods higher in protein, such as enriched soymilk, beans, tofu, tempeh, nuts, and nut butters in addition to a wide variety of fruits and vegetables. While the focus on protein is important, the leafy green vegetables such as collards, kale, mustard greens, turnip greens, and spinach are also necessary for their high content of folate known to prevent neural tube defects such as spina bifida. Patients recuperating from surgery or serious bodily injuries, such as burns, require extra protein to help rebuild tissue. Their protein intake should be at a level of about 20 % of their calorie intake. If you’re an athlete or one who works at serious bodybuilding, one or more of your trainers may have suggested using protein powders or amino acid powders on a regular basis. Sports nutrition has focused heavily on protein. Recent studies suggest that strength athletes (weight lifters) and body builders need to consume up to 2.0 grams per kilogram of body weight to maintain sufficient amino acid balance. Some trainers recommend higher levels of protein intake, even exceeding 3.0 grams per kilogram. Endurance athletes require 1.2 to 1.4 grams per kilogram of body weight to provide for repair of muscle cell damage. A diet that consists of 12 to 15% protein is considered ideal for both strength and endurance athletes who follow a vegan diet. For vegan athletes who want to keep their body weight low, 15 to 20% of calories should be protein. About 10 to 12% of calories as protein may be all that is required of those on very high calorie diets such as ironman athletes. Where do vegans get their protein? It’s simple. The plant-based diet includes a wide variety of whole foods consisting of beans, whole-grains, fruits, vegetables, nuts, and seeds, along with products made from these natural foods, such as tofu, tempeh, and meat analogs. Those who believe plant protein is inferior to animal protein may be surprised to learn that plant proteins contain the same 22 amino acids as animal proteins. Protein, one of the three macronutrients, is composed of amino acids, often referred to as building blocks. 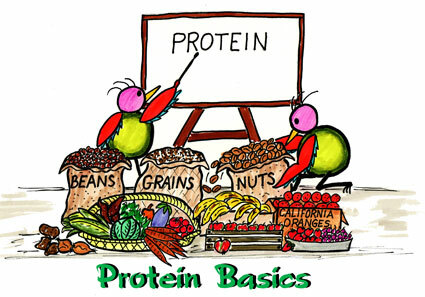 A complete protein contains 22 amino acids. From the foods we consume, the body has the ability to manufacture most of the amino acids it requires. Nine of these amino acids are the exception: isoleucine, leucine, lysine, threonine, tryptophan, methionine, histidine, valine, and phenyalanine. This group of amino acids is considered essential to the body and must be obtained from the foods we eat. Animal foods like meat, chicken, fish, eggs, and dairy products all contain complete protein–that is, all 22 amino acids. Complete protein in the vegan diet is found in the grain quinoa. Soybeans and products made from soybeans like tofu, tempeh, and miso, also contain complete protein. Soy sauce is not a complete protein. Plant-based foods like legumes, most whole grains, fruits, vegetables, nuts, and seeds all contain protein but do not contain complete protein by themselves. However, the body forms an amino acid pool from the foods eaten throughout the day. When a vegan consumes a variety of foods eaten at breakfast, lunch, and dinner, the body can use these amino acids to make up complete protein. Nutritionists advise that if a person is eating a broad selection of plant-based foods and consuming adequate calories, it is unlikely he or she will be protein deficient. Physicians in the United States rarely encounter patients who are deficient in protein. Deficiency is uncommon and is seen mostly in countries where serious shortages of food exist and malnutrition is prevalent. More common are the problems resulting from eating too much protein. In contrast to the U.S. RDA calculations, the average person in America consumes foods containing 100 to 120 grams of protein daily, mostly from animal products. Americans are also noted for their sedentary lifestyles. Excess protein especially of animal nature puts a great deal of stress on the kidneys. Some people, unaware that their kidneys are not operating optimally, could suffer premature aging of this important organ. A diet too high in protein could cause deterioration of the nephrons, which are the kidney’s filtering system. That same diet places people at risk for developing kidney stones. Other health conditions that may result from an overabundance of protein include excessive calcium leaching from the bones and causing osteoporosis, acid reflux, obesity, plaque build-up in the arteries, high blood pressure, pain from arthritis, high cholesterol, bad breath from sulfur-containing amino acids, and increased risk of cancer, especially colon cancer. The charts below, using figures from the USDA Nutrient Database, list the protein content of the plant-based foods that comprise the vegetarian and vegan diets. People are often surprised to learn that all plant foods contain protein. In fact, it is protein that gives all plants their structure. Whether plants grow upright or sprawl on a vine, protein is a basic component of their cell structure. Davis, Brenda and Vesanto Melina. Becoming Vegan. Summertown, Tennessee: Book Publishing Company, 2000. Fuhrman, Joel. Eat to Live. New York: Little Brown and Company, 2003. Heidrich, Ruth. E-mail interview. 14 April 2003. Klaper, Michael, Pregnancy, Children, and the Vegan Diet. Paia, Hawaii: Gentle World, Inc., 1997. Melina, Vesanto and Brenda Davis. The New Becoming Vegetarian.Summertown, Tennessee: Healthy Living Publications, 2003. Posted on July 11, 2014 by Health and Food MattersPosted in Food, HealthTagged health, Nutrition.